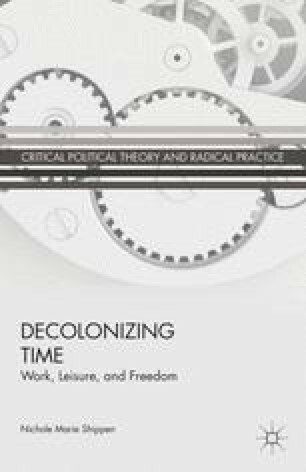 Chapter 1 focused on Aristotle’s understanding of leisure as the ideal form of temporal autonomy, or the ability to control one’s time in a meaningful and self-directed way. In the context of Athens, discretionary time for the exercise of temporal autonomy was made possible for male citizens by assigning necessity (biological, financial, and household) to women, servants, and slaves in the context of the private household.1 This division of labor allowed male citizens time for active and sustained participation in politics, and leisure as contemplation, at the expense of the respective development of these particular human beings. Despite Aristotle’s acceptance of this unequal division of labor, his analysis of the distribution of time across necessity and freedom revealed time to be a collective or social resource shaped by specific political-economic constraints, and not simply an individual’s property abstracted from his or her social position, as liberalism is wont to frame it today. What this means is that the relationship between the state and the economy, and in particular the strength of the welfare state combined with a commitment to equality or lack thereof, is central to the overall availability of discretionary time and temporal autonomy for all.2 In other words, the aphorism that in the United States we “live to work,” rather than “work to live” is more compulsory than it is a genuine “choice.” For work to be an actual choice there would need to be a stronger public welfare state combined with public policies that allowed individuals to spend more time not working if they chose to do so.